This pack contains over one hundred miniatures from the adventures in Pathfinder Adventure Path #20: "House of the Beast". In this set you will find a mad doctor, a Gargantuan centipede, one very large gnoll king, and more! 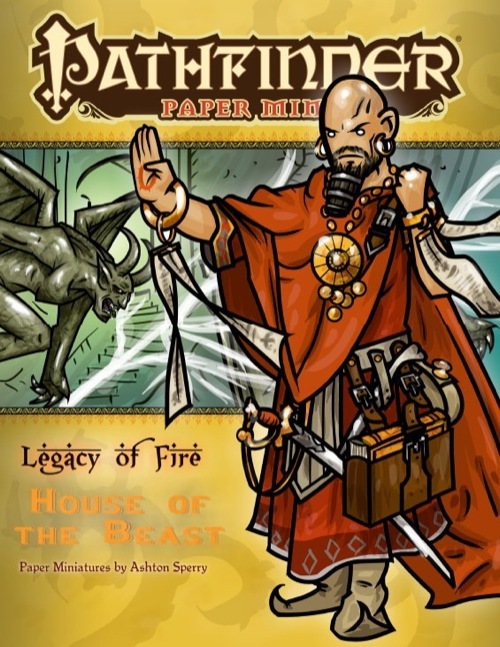 Designed for use with the Legacy of Fire Adventure Path, these minis are perfect for any game. Great product! I can't say enough about how nice it is to have the right mini for the monster or npc! These are really great looking. The giant centipede should be a blast and the carrion king is great.you get all the unique monsters and npc which is awesome. I really loved the unchosen and the giant centipede. This set is freaking awesome. Anyhoo. This set's got a lot of good stuff in it. Hyaenodons? Check. Madfang? Check. Several tasty variations on the theme of Zayifid? Check. Twelve-foot-tall Carrion King? Check. Lemme know whatcha think, gang! Another success. Ghartok, The Carrion King looks freaking awesome. You know I was thinking, an idea you could do if you had interest is making minis of the NPC's that are in the books but not part of the plot, such as Fayar on page 63 of House of the Beast. Or characters that show up in Dark Markets (like the awesome looking half orc on page 16) or the Guide to Korvosa. That way players could use them for their characters and DM's would have more reason to bring these NPC's into the plots somehow. At any rate, great job on this one. Hope PaizoCon was fun. Maybe I'll come next year when I'm less busy and more wealthy. Is a "bestiary" set planned for PF #20 too? Yep, and it's mostly done; I've gotta pick up some ink cartridges so's I can print out the set for the cover, then I'll upload it ASAP. Worst-case scenario, I hope to have it out late next week, but if I can scrounge up some cash for cartridges, I'll have it out much sooner. Should be up and out soon, though. I'm having a really great time with the paper minis for this AP (and with the generic monster sets too), looking forward for the next set. I just wanted to put in a plug for more of these minis, as many as humanly possible! They're wonderful fun and would be a huge boon to future Paizo adventure paths as far as I'm concerned! Has there been any talk about doing any minis for the earlier AP? I am about to run "Burnt Offerings", and I would love to have the other badies to go along with the goblins I bought. I hope so. . .I love the minis, and am trying real hard to make this game extra special. The players are new and I'm trying to hook them hard. Any chance we see a set for CRYPT OF THE EVERFLAME soon?! I am just about to start running this and was hoping that the sets would continue to flow. We got the first two modules covered and then silence decended on the land of Leagcy of Fire. Does anyone know if the paper minis are going to be produced for the rest of the AP?? 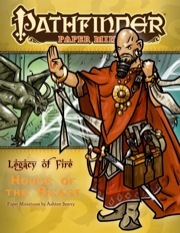 Does anybody know whether there are more paper minis to come for the Legacy of Fire AP? I want to know this too! Not that my party has scratched the surface of part 1, but the caravan and pugwumpis have been great so far. I really want to see more! I want to know if the paper minis line died because of the Reaper deal. I loved the goblin minis, and wish there were a lot more. We fans can always make them ourselves, but I'd like to still support Paizo. I can always use more paper minis. Especially module-oriented ones. And my players love the art style too. The lack of new Paper Minis has nothing to do with Reaper; I gather it's a matter of N'wah not having enough time lately. I know we'd all like to see more! Good to hear. More paper minis! And yes, the Carrion King and Centipede are FRIGHTENINGLY Big. what minis are in this set? so is this Ap paper mini dead in the water? I'd like to say it's not, but I'm still waiting to hear back from the artist on the status of this particular set update. Also, to answer your question in the review, this set is from the first round of the Pathfinder Paper Minis and does not include all of the minis required for the adventure. When it is updated to the new standards, it will be, and I will update the product description accordingly. wow thank you so much, it is now freaking amazing. Updated! The set now includes all of the miniatures you need to run both the main adventure, "House of the Beast", and the sidetrek adventure, "Coils of Flame"—over 100 miniatures. The next one should be especially pleasing then, what with all the non-combatant Katapesh residents like Rayhan, that cleric of Abadar, and whatnot. I personally have gotten a lot of use out of various minis sets from all the contributors. Crystal's brigands from the first Kingmaker set get used a lot as general human thugs, and everyone loves the goblin cook from Callous Jack's earlier stuff. I'm seriously considering, with Liz's say-so, putting the old sets I did up on my DeviantART page for free. Well the new set looks really great. I love that you guys have been able to create so many of these. I like normal plastic minis but to be able to print exactly the number and type of minis I need for a game is so useful. Besides it appeals to my love of art too. And yes, I am looking forward to the next set for Legacy. I have gotten quite a bit of use out of the first set, and expect to do so for this one as well, but I probably have enough gnolls to last a lifetime. Great set! They look amazing. I'm looking forward to the next one as well! I'm taking an impromptu poll to see if anyone would shed tears of scarlet if the generic gnolls (hereafter referred to as "generignolls") can from earlier stuff. Named and leveled gnolls get the new ert, but the outta-the-box guys get stuff from PF 19 and 20. Any beefs? And thanks for the positive reviews! I'm hoping to fix the low reviews back when the set was, like, 1/12th the size. Glad you liked the Unchosen, bignate. I came THIS close to re-drawing them, but that could just be the usual artistic dissatisfaction. I wouldn't shed tears of purest crimson or anything, but a few more generignolls would increase the value of the set. As it would increase the range of generignolls available to use your adoring fans. No issues at all, but it would be nice to have more variety nonetheless. Even some non-combatant ones. I would not mind additional generignolls, but they aren't going to be a priority. If you wanted to include copies from the first two modules, I wouldn't mind. If you feel like adding some later, the pdf can always be updated. No tears here, just of joy that I got this PDF in time to start the house of the beast. Though I stayed up all the night before to make them in time lol. Any hope of finishing out this AP with paper minis for each module? I'm about to finish up the first module and I'd love to prep the minis for modules 3-6 sooner rather than later. thought I would continue the asking about when the next set is coming out. Still no word for a long time. I hope sometime soon I am finally going through this adventure path. Please? with sugar on top?